In this latest short video, I show you how to prep belts for tooling. When tooling belts, they will usually want to stretch some because of the stamping process. This is the method that I use on virtually all the belts that I make to help prevent this. Many leatherheads will use a heavy packing tape on the back of the belt blank and then remove it when the tooling is completed. I find the tape a bit hard to deal with so I use poster board strips in my belts. I find the added body that it gives my finished belts a nice plus. This is a short video just to show you how I prep my belts for tooling and should clear up some of the questions that I get concerning this important step. Thanks so much for checking it out and I hope it offers value in your shop! I want to thank all our customers for making 2011 a great year so far and with all this growth we at DGSaddlery are doing our best to insure the quality and timely delivery of all your custom leather goods. With my time being better spent designing all the artwork that is requested on our beautiful saddles and gift items, I have very little time left to handle a lot of the day to day management duties. 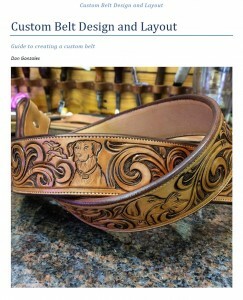 So as of last week Jim McFerrin will be in charge of all saddle making in our shop. Jim has been with us for five years or so and has built probably 90 percent of the saddles that have come out of our shop. Jim has over 35 years of custom saddle making experience and has used that knowledge to help us design the look and feel that has made our saddles the best on the market. With him handling the build process from time of order to delivery, will insure that our saddles quality remains consistent and completion is timely. When it comes to small items such as custom belts, wallets, chaps, and other gift items, Jodi Finke will be in charge of all the duties there. Jodi has been most of our customers’ go to person and now she can devote more energy to managing those jobs to completion. Jodi has been with us for four years and is a true asset to our system. Feel free to call the shop and talk to either one of these great craftsmen and don’t worry, I am not going anywhere… I will be at my table drawing and tooling. I will still be building saddles and other items, but that depends on what the bosses tell me to build when I’m not drawing. Thanks again and we look forward to finishing the year as good as the first half!